– Derek McKenna breaks down some of the Government’s myths about ‘Jobsbridge’ and explains how it serves only to provide exploitative employers with free labour. As a recent university graduate and new member of Ireland’s massive 14% + unemployed club, I have been eagerly scouring the internet looking for work. Of course this task was never going to be easy with over 400,000 others on the dole queues, but the task is not being made any easier by the government’s promotion of free labour for employers through the normalisation of internship schemes. A cursory glance over any jobs website with show that many companies are no longer hiring for real jobs and it is only internships on offer. I mean one can’t blame the companies can they? If you run a for-profit business and there is free labour on offer, you would be mad not to take advantage of it. This all seems legit and wonderful, a win-win situation one might say. I mean who doesn’t want to give opportunities to unemployed people, to enhance the performance of their organisation and to bring in fresh talent, fresh ideas and new thinking? What is the catch one might ask? Well, there isn’t one. It’s free! The logic for businesses under the capitalist system is to make as much profit as possible. This profit is produced when workers produce or provide a good or service for an employer. The employer pays the worker less than value of that particular good or service and then sells the good or service onto a consumer. It is the difference between what the employer pays the worker for the good or service and what the employer sells that good or service for that is the profit (minus production costs). Now if an employer can pay an employee as little as possible (i.e. the minimum wage), they can make more profits. If that employer can hire an ‘intern’ to work for nothing then that employer makes absolute profit. It therefore logically follows that the concept of internships are a capitalist construct, dressed up in the fancy terminology of reciprocity and designed to increase profitability for businesses. One of the “Internships” on Offer. This piece was orginially posted on We Only Want The Earth. Half of you leftie losers are probably doing internships with law firms. Hypocrites. Care to explain that comment Conn? From those I know who’ve written for this Blog and those in general who are young and left-wing, I can’t name one person who is doing an internship with a law firm. Even if they were, how would being forced to get experience somewhere disallow that same person from criticising the form of experience they are getting? Very interesting article – quite one sided though, I completed a 6 month internship unpaid with a startup while I was in college which was hugely beneficial, and provided me with much better experience than most paid internships would. I didn’t get hired by them as I still had to finish my degree but got snapped up by a different company but the interviews were based hugely on the experience I gained during that internship. I know that’s not the case for everyone, but just thought I’d point out there are some success stories! Wouldn’t a simple yelp like site for internships not solve all the problems mentioned here? I don’t see any mention of sites like Glassdoor which aim to tackle these exact kind of problems. Seems like the author could do with a journalism internship, where he can learn all about such alien concepts as “research” and “facts”. What is is not factually correct Richard. 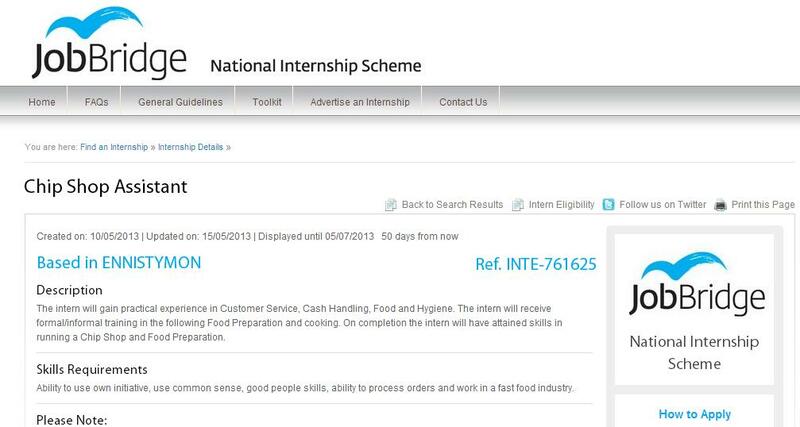 Do you dispute the “fact” that internships are being offered as chips shop assistant, car valet etc etc? Completely agree. People looking for paid employment end up working for free, but still on the dole, sometimes with an extra allowance of fifty euro. Is it not a bit counter-productive to increase people’s reliance on government payouts?